In this article, the second in the series, Robert Sheldon demonstrates how to manage the SQL Server security with granting permissions to users, logins, and groups. One of the most important tasks that DBAs must perform when managing a SQL Server database is to ensure that authorized users can access the data they need and carry out the necessary operations on that data. To this end, SQL Server includes a number of components for authenticating users and authorizing them to access objects at the server, database, and schema levels, while preventing unauthorized users from doing anything they should not. In the first article in this series, I introduced you to authentication and authorization as part of a larger discussion about SQL Server security. In this article, I dig deeper into these topics and provide some examples that demonstrate how to implement basic access controls on a SQL Server 2017 instance. You should also refer to Microsoft documentation as necessary to ensure you fully understand what types of access you’re granting to your users and what tasks they can and cannot perform. A good place to start is with Security Center for SQL Server Database Engine and Azure SQL Database, which covers a number of important aspects of SQL Server security, including access control. Principals: Individuals, groups, or processes granted access to the SQL Server instance, either at the server level or database level. Server-level principals include logins and server roles. Database-level principals include users and database roles. Server-level securables include such objects as databases and availability groups. Database-level securables include such objects as schemas and full-text catalogs. Schema-level securables include such objects as tables, views, functions, and stored procedures. Permissions: The types of access permitted to principals on specific securables. You can grant or deny permissions to securables at the server, database, or schema level. The permissions you grant at a higher level of the hierarchy also apply to children and grandchildren objects, unless you specifically deny those permissions at the lower level. Together, these three component types provide a structure for authenticating and authorizing SQL Server users. You must grant each principal the appropriate permissions it needs on specific securables to enable users to access SQL Server resources. 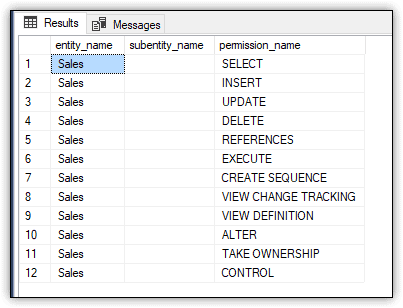 For example, if the sqluser01 database user needs to be able to query data in the Sales schema, you can grant the SELECT permission to that user on the schema. The user would then be able to query each table and view within the schema. One way to check effective permissions without writing scripts yourself is to use Redgate’s SQL Census. It creates a report of who has access to what on your SQL Servers and helps you improve your overall security model, too. It’s still in development so doesn’t yet give a comprehensive view down to object level, but it’s a good starting point to check on your SQL Server permissions and undertake any necessary cleaning tasks. At the server level, create a login for each user that should be able to log into SQL Server. You can create Windows authentication logins that are associated with Windows user or group accounts, or you can create SQL Server authentication logins that are specific to that instance of SQL Server. Create user-defined server roles if the fixed server roles do not meet your configuration requirements. Assign logins to the appropriate server roles (either fixed or user-defined). For each applicable server-level securable, grant or deny permissions to the logins and server roles. At the database level, create a database user for each login. A database user can be associated with only one server login. You can also create database users that are not associated with logins, in which case, you can skip the first four steps. Create user-defined database roles if the fixed database roles do not meet your configuration requirements. Assign users to the appropriate database roles (either fixed or user-defined). For each applicable database-level or schema-level securable, grant or deny permissions to the database users and roles. You will not necessarily have to carry out all these steps, depending on your particular circumstances. For example, you might not need to create any user-defined roles at the server or database levels. In addition, you do not need to follow these steps in the exact order. You might grant permissions to server logins or database users when you create them, or you might create server roles and database roles before creating the logins or users. The steps listed here are meant only as a guideline. The examples in the following sections walk you through the process of creating principals and assigning permissions to them for specific securables. All the examples use T-SQL to carry out these operations. You can also use features built into the SQL Server Management Studio (SSMS) interface to perform many of these tasks, but knowing the T-SQL can make it easier to repeat steps and add them to your scripts. SQL Server supports four types of logins: Windows, SQL Server, certificate-mapped, and asymmetric key-mapped. For this article, I focus on Windows and SQL Server logins, using the CREATE LOGIN statement to define several logins. Because logins exist at the server level, you must create them within the context of the master database. The statement must include the FROM WINDOWS clause to indicate that this is a Windows login. In this case, the statement also includes an optional WITH clause, which specifies a default database and language. By creating a login based on a group, you can provide the same level of access to any user within that group, while letting Windows and SQL Server handle authenticating and authorizing the individual users. For the password, you can provide a string value, as I’ve done here, or a hashed value, along with the HASH keyword. You can also define additional options. In this case, the WITH clause includes the MUST_CHANGE option to force the user to change the password when first logging into SQL Server. The clause also sets the CHECK_EXPIRATION option to ON, which means that the password expiration policy will be enforced on this login. The SELECT statement joins the two catalog views and filters the results by the two logins, using the SUSER_ID built-in function to retrieve each login’s principal identification number. Figure 1 shows the data returned by the SELECT statement. The results show that both users have been assigned the IMPERSONATE ANY LOGIN permission, along with the CONNECT SQL permission, which is assigned by default to all logins to enable them to connect to the SQL Server instance. A server role makes it possible for you to group logins together in order to more easily manage server-level permissions. SQL Server supports fixed server roles and user-defined server roles. You can assign logins to a fixed server role, but you cannot change its permissions. You can do both with a user-defined server role. The CREATE SERVER ROLE statement defines a server role named devops. If you want to specify an owner for the server role, you can include an AUTHORIZATION clause. Without the clause, the login that executes that statement becomes the owner. The GRANT statement grants the ALTER ANY DATABASE permission to the devops role, which means that any members of that role will acquire that permission. The ALTER SERVER ROLE statement adds the winuser01 login to the devops role. The statement’s results should confirm that that devops role has been granted the ALTER ANY DATABASE permission. The results from the SELECT statement should indicate that the winuser01 login has been added to the devops role and that no other logins are included. Of course, in a real-world scenario, you would be adding multiple logins to a user-defined server role. Otherwise, there would be little reason to create it. After you’ve set up your server-level logins, you can create database users that map back to those logins, whether they’re Windows or SQL Server logins. You can also create database users that do not map to logins. These types of logins are generally used for contained databases, impersonation, or development and testing. You can create only one user in a database per login. If you want to try out both these statements, you’ll need to drop the first user before creating the second. The examples that follow are based on the win10b\winuser01 user. The two preceding examples also include a GRANT statement that assigns the ALTER permission to the user on the Sales schema. As a result, the user will be able to alter any object within that schema. Notice that the statement includes the SCHEMA::Sales element. When you grant a permission on a specific object, you must specify the type of object and its name, separated by the scope qualifier (double colons). In some GRANT statements, the securable is implied, so it does not need to be specified. For instance, in an earlier example, you granted the ALTER ANY DATABASE permission to the devops role. Because you granted this permission at the server level for all database objects at that level, you did not need to specify a securable. SQL Server also lets you create a user that is not associated with either a login or Windows account. To do so, you must include the WITHOUT LOGIN clause, as shown in the following example. Creating a user without a login can be useful for development and testing. More importantly, it can be used with SQL Server’s impersonation capabilities. Users can authenticate to SQL Server under their own credentials and then impersonate the user account that’s not associated with a login. In this way, the authentication process can be monitored, but specific types of permissions can be granted to the unassociated user. The CREATE ROLE statement creates the database role. The GRANT statement grants the role the SELECT permission on the database. The two ALTER ROLE statements add the winuser01 and sqluser01 users to the role. In some cases, you might want to see the effective (cumulative) permissions granted to a principal on a securable. A simple way to do this is to use the fn_my_permissions table-valued function, specifying the securable and its type. The fn_my_permissions function takes two arguments: the target securable and the type of securable. In this case, the target securable is the Sales.BuyingGroups table, and the securable type is OBJECT, which includes schema-level securables such as tables, views, and stored procedures. Figure 3 shows the results returned by the SELECT statement. As you’ll recall from the previous section, the ALTER permission was granted to winuser01 after the user was created, and the SELECT permission was granted to the role after it was created. Notice that each of the table’s columns is also assigned the SELECT permission. The SELECT statement returns the results shown in Figure 4, which are specific to the user specified in the EXECUTE AS statement. This time, the ALTER permission is not included in the results because that permission was never granted to that user. Use a GRANT statement to enable principals to access specific securables. Use a DENY statement to prevent principals from accessing specific securables. A DENY statement overrides any granted permissions. Use a REVOKE statement to remove permissions that have been granted to principals on specific securables. Permissions are cumulative in that the user receives all permissions granted specifically to the database user as well as to its associated login. Also, if the user has been assigned to a database role or if the login has been assigned to a server role, the user receives the role permissions as well. Permissions are also transitive, based on the hierarchical nature of the server, database, and schema securables. For example, if you grant the UPDATE permission to a user for a specific database, the user will also be granted the UPDATE permission on all schemas and schema objects such as tables and views. Figure 5 shows the results returned by the SELECT statement. In this case, the fn_my_permissions function specifies the BuyingGroups table as the target object. As a result, the SELECT statement now returns 25 rows of permissions on that table for sqluser01. Figure 6 shows the first 13 rows from that result set. The SELECT statement returns an empty result set, indicating that sqluser01 no longer has any type of permissions on the BuyingGroups table. Once again, the ALTER permission is no longer listed. Once again, the results indicate that only the SELECT permission has been granted on this table, as shown in Figure 7. When working with permissions, be careful not to confuse the DENY statement with the REVOKE statement. You could end up unintended consequences when users receive permissions from multiple sources, as in the examples above. 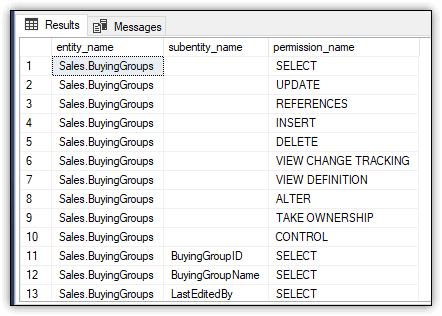 For example, if you had denied sqluser01 the CONTROL permission to the Sales schema, rather than revoke the permission, the user would no longer have SELECT permissions to the schema and its objects. Controlling access to SQL Server becomes an increasingly complex process as more users are added and the data structure itself becomes more complicated. Your goal should be to limit users to the least amount of privileges they need to do their jobs. Don’t grant the CONTROL permission on the database when they need only the SELECT permission on a couple of tables. At the same time, don’t make more work for yourself than necessary. If a user needs the SELECT permission on all tables in a schema, grant the permission at the schema level. SQL Server provides the ability to grant users the access they need at the level they need it. 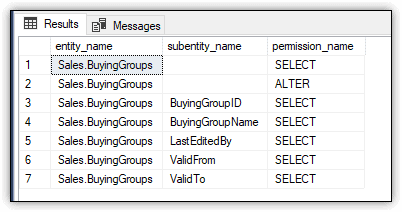 The GRANT, DENY, and REVOKE statements—along with the wide assortments of permissions (230 in SQL Server 2016 and 237 in SQL Server 2017)—make it possible to implement controls at a very granular level, while still providing the flexibility necessary to accommodate access at a higher level in the object hierarchy. However, controlling access takes careful planning and implementation. This is not the time for shortcuts or casual one-offs. The more diligently you control data access, the better for everyone and the more precise the control you have over the data. Great article. It would be awesome if there were an article on how to set permissions to create and run SQL Agent jobs in SSMS. All too often, there are exception of invocation errors when the SSIS package is running a Script Task to manipulate other objects on a computer (example .txt,.xlsx, xlsm, accdb etc etc). Running Script task packages will work fine in Visual Studios and SSISDB catalogs but once an Agent Job is created it doesn’t want to play nice.